There are two main bidding methodologies. PPC Marketers either use third party tools like Acquisio Turing for automated bidding or they do manual bidding at the publisher level. So which is better? There is no right answer because each campaign, each business, etc is unique and there are pros and cons to each. In many cases the bidding type is defined by the advertiser preference and goals. On Thursday, April 5 we combined forces with one of our favorite agency clients, Hanapin Marketing, to talk bidding strategies. Our Director of Client Services, Nessa Plotkin, looked at the pros and cons of manual bidding versus automated bidding. On Hanapin’s side a Senior Account Manager, Stephanie White, took an in-depth look at which bidding strategies to apply and why. A copy of the webinar is available here for anyone who missed it, but you can also read on to get in on some of the insights shared. With manual bidding, campaign managers are in the driver’s seat adjusting bids on ad groups and keywords at the publisher level. This type of bidding requires campaign managers to really understand the auction to make strategic decisions. Some of the main benefits of manual bidding are that marketers have full control over their bids. They also benefit from being able to react quickly in the auction. For example, if you wanted to boost the bid on only one keyword in a campaign because of an upcoming sale, you could do that. Similarly, campaign managers don’t have an entire campaign taken over by a particular bid strategy. From this respect, campaign managers can get more granular with manual bidding than with automated. However, the more the accounts the more time it takes to optimize each of them. So with that in mind, the larger and more complex the account, the larger the challenge. 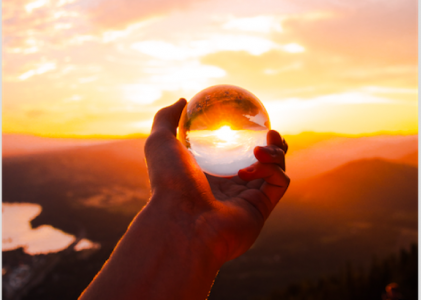 With potentially hundreds of keywords and dozens of ad groups, there’s simply more to consider and more adjustments to make in order to get the intended results. Additionally, the human error factor is unavoidable when we do things manually. What’s more is that with manual bidding, humans tend to adjust bids with precise round numbers like by 25 cents or 10 cents to make further analysis easier, whereas in automated bidding the machine will adjust bids by $.o8 or $1.26 or any other uneven or odd number it deems necessary to drive performance results. Hanapin uses manual bidding a lot. But sometimes accounts are just so big that manual bidding can become too much to manage and this is where automated bidding really shines. For example, one of our mid-size agency accounts has 189 accounts and 1,140 campaigns and Acquisio Turing bidding algorithms perform an average of 109 000 adjustments per day to optimize PPC for this one agency. It would take an enormous and talented PPC team to achieve the same thing that automated bidding can. Automated bidding does exactly what it says, adjusting bids and budgets automatically to achieve the best performance possible using machine learning. Campaign managers set the targets and restraints, whether it’s CPC or budget targets for example, and the system will take over and respect those goals and limits 100%. Allowing the system to take over bid and budget control frees up time for campaign managers to do more, be more efficient and scale the number of accounts they can manage effectively at once. The machine has no limit to the amount of accounts, keywords or ad groups it can manage. 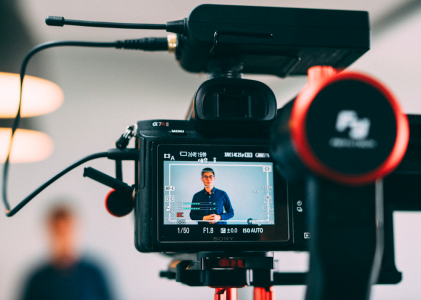 With automated bidding responsible for bid adjustments on accounts all day everyday, campaign managers can focus on testing ad copy creatives, landing page creatives and other aspects of PPC management that can improve performance. But of course make sure that you’re always giving the machine the right kind of data. If you have consistent conversion data, it’s an ideal scenario to put the account on machine learning. If not, performance may not be as good as it would be starting off with the right parameters for optimization in the auction. 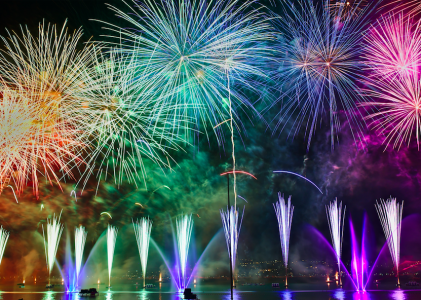 Brand new campaigns, short term promotional campaigns and extra small accounts are all situations where automated bidding won’t deliver as immediate results (there are some exceptions to the small business PPC account conundrum though!). Other disadvantages with automated bidding include a lack of flexibility. If campaign managers need to increase average position for a certain keyword because the client requests it, it’s very hard to exclude that one keyword from the automated bidding campaign to achieve that. In this case more work would have to be done by a human to separate that keyword or ad group. From this perspective, another drawback is that automated bidding is never truly automated – human set-up, oversight and occasional intervention is still required to make it all work. Hanapin’s team has a ton of experience managing different client accounts and as such they are well seasoned with knowledge on when to apply a manual approach to bidding and when to let the machine take over. 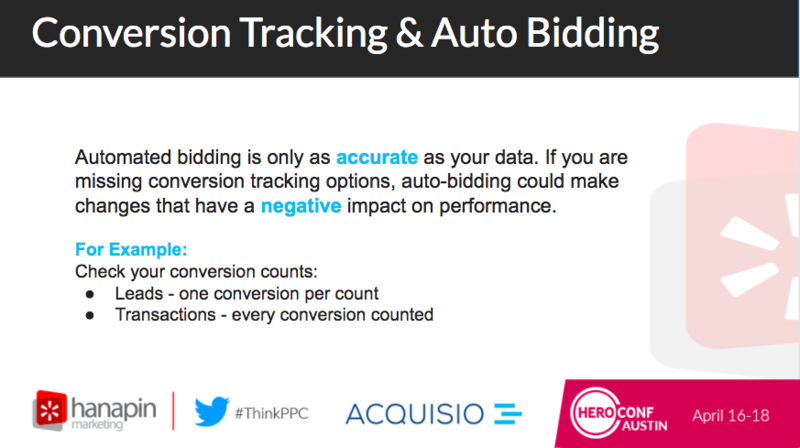 Automated bidding works best with one conversion type. With manual bidding you can separate based on different conversion types. 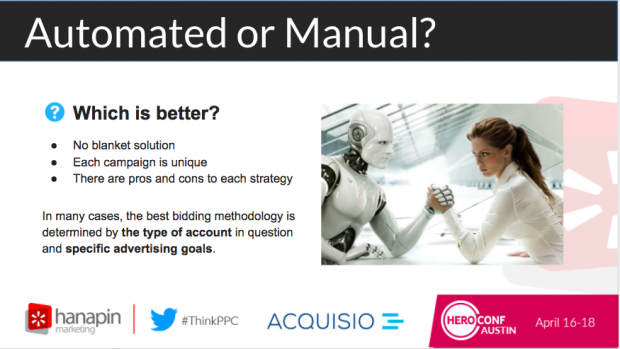 Campaign managers are better off using automated bidding when they have figured out which conversion type works best for their campaign or account. That means they should be using manual bidding strategies to determine which conversion type works best for them before turning on machine learning. However, as we’ve said before not all conversions are created equally. Make sure when you push data into the system to automate that it’s the most important data. If you’re looking for newsletter signups and sales in a campaign, the signups may not be the most important type of conversions for your business and you may want to keep this type of goal in manual, for example. The type of data that you give the automated bidding system is most important. In addition to conversion type, campaign managers have to have accurate data for the system to deliver the best results. A good example would be having accurate conversion counts for leads. If the wrong type of data is given to the automated bidding system, you could actually have a negative impact on your accounts. Other parameters can impact accounts transitioning to machine learning like bid modifiers. 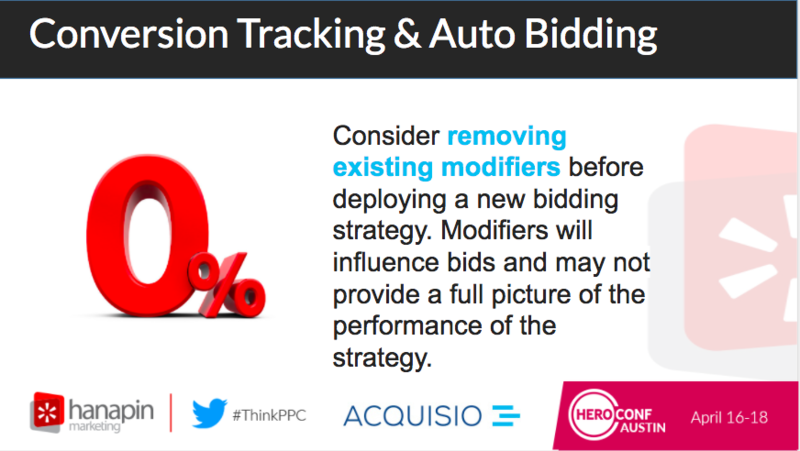 Consider removing existing bid modifiers before deploying an automated strategy, because these will influence bids. If you have a negative modifier for a particular location or time of day for example, your bids will be adjusted with the machine learning system AND according to the initial bid modifiers on top of that. Since automated bidding systems work with live data and optimize accounts in real-time, accounts with long conversion windows aren’t ideal for this type of strategy. Automated bidding works best with short conversion windows, ideally around 24 hours. A client account with conversion windows that have a 15-day lag-time for example wouldn’t work well inside an automated bidding system because the machine will be reacting to changes that happened almost two weeks prior. Similarly, any short term ad campaigns don’t work well for automated bidding, because the system doesn’t have enough time to learn. Know which conversion type works best before switching from manual to automated bidding. Figure out what’s important to you or your client before you go head-first into automated bidding. Choose a bidding strategy and go with it! Each strategy needs time to stabilize. If you switch too often, you can’t make any conclusions from the data. Like anything in life, there is a time and a place and bidding strategies are no different. Each type has pros and cons. Check out the full webinar for all the dirty details on automated versus manual bidding strategies, but in the meantime – happy optimizing!